Jan 6, 2018 9am-12noon- Learn more about the animals that are kings of the refuge like alligators, eagles, monarch butterflies, and alligator snapping turtles as well as crafts that go along with them. Drop in between 9 and noon. Students from Texas State University will be making this a bilingual event. Guest Speaker: Chris Doffitt, Louisiana Wildlife & Fishers, will speak to us about the Natural Areas Registry program, followed by a 30-minute meeting. 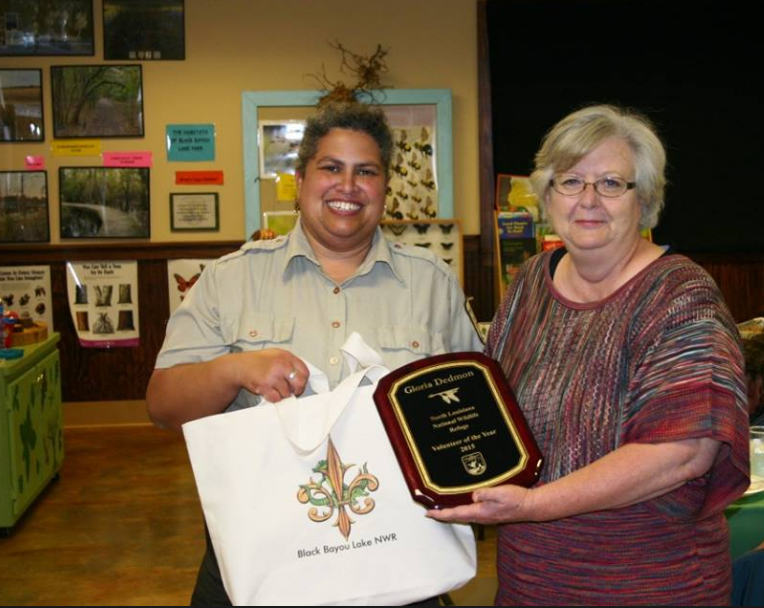 Join the Friends of Black Bayou for our monthly meeting, help plan for upcoming events and get updates on all the amazing projects at the Refuge! Bring a friend! We will be able to see a small portion of the eclipse before the moon sets. Come and join the ranger on the East Side of the pier. She'll bring the telescope, coffee, and hot water for hot chocolate. You bring your cup and we will see how much we can view. Celebrate the Super Blue Moon with a special performance by the Bayou Blend Barbershop Quartet. Meet at the Learning center at 6 for the walk out to the pier and when the moon has risen we will be at the amphitheater for music, bonfire, and smores. Our monthly kids program is going to be about coyotes and foxes this month in celebration of Year of the Dog. Join Guide Roselie Overby for a guided bird walk in celebration of the Great Backyard Bird Count. We will be keeping track of species to include in the GBBC. Bring your binoculars or borrow a pair of ours and learn about birds on the refuge. 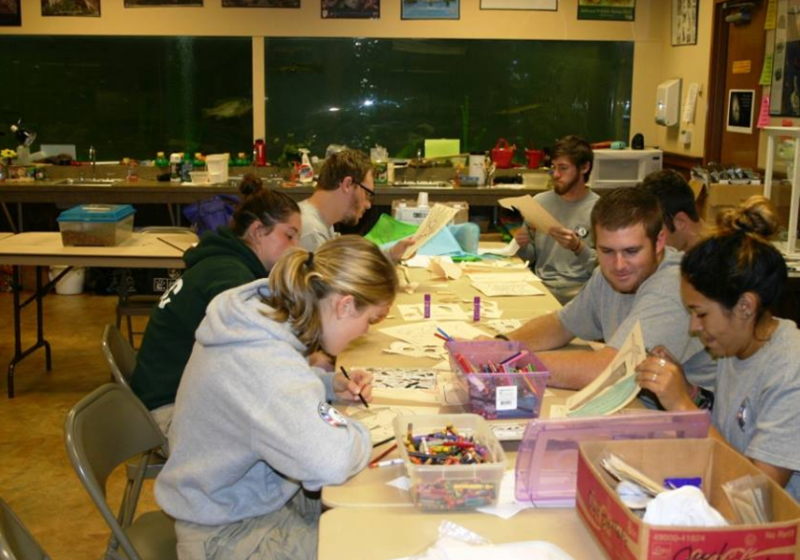 Bring the family out to learn more about birds with a variety of activities. You can join the guided bird walk at 10 AM or stay around the learning center for a variety of bird-themed activities that are kid friendly. The Louisiana Bluebird Society will be letting you know all the basics about bluebirds include how to attract them to your yard and the where and how to put up bluebird boxes. 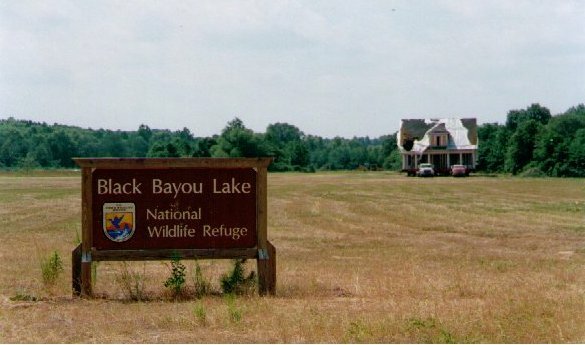 Join Complex Forester for a Walk and Talk about Invasive Species here at Black Bayou, their impact on the refuge, what we are doing about them and how you can help. Join local photographers Burg Ransom, Richard Pleasant, and Will Watson to learn more about how they take those great photographs. Then take a hike with Refuge Manager Erin Cox to practice those techniques. Join Friends of Black Bayou as we participate in the 2018 Great American Clean-up with our partners at Ouachita Green. Free canoe rentals all day if you retrieve litter on the lake while out, and we will provide a free lunch for our morning volunteers who help us hit the trails! Meet at the Visitor Center at 9AM for a quick orientation and supply pickup. We will provide the tools and trash bags! More information to come! Bring a friend and enjoy the wonderful refuge as we make a difference in our community! 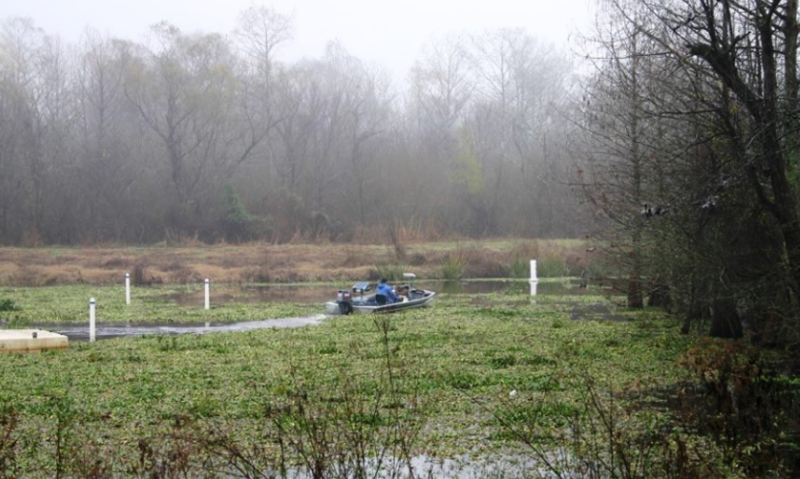 A spring 2018 presentation on the BBL wildflower project and combat of aquatic invasives by Wildlife Refuge Specialist Adam Rogers, aquatic spray boat operator for all of 2017 and wildflower planter of almost 7 acres of over 50 species of native wildflowers. April 20th Dark Sky Night! Sky viewing from 8pm-11pm Boat Launch Parking Lot Near Pier. Come explore the sky at this great after hours event! April 28th 10AM Members Event: Free Canoe Trip! Join friends for a members free canoe trip to the Eagle's Nest with lunch to follow! The Northeast Louisiana Arts Council is proud to present the first ever Northeast Louisiana Summer Film Series. The film continues June 20 with All Over But to Cry. Louisiana’s spirit of survival meets the powers of Hurricane Audrey, the deadliest cyclone in American history. The Arts Council partners with Black Bayou Lake National Wildlife Refuge to feature this Louisiana-directed and Louisiana-made film. This film is 60 minutes long. All films will be shown at 7:30 p.m. at the Flying Tiger Brewery every third Wednesday this summer. Doors open at 4 p.m. Tickets for non-members are $5. Arts Council members will receive free tickets. 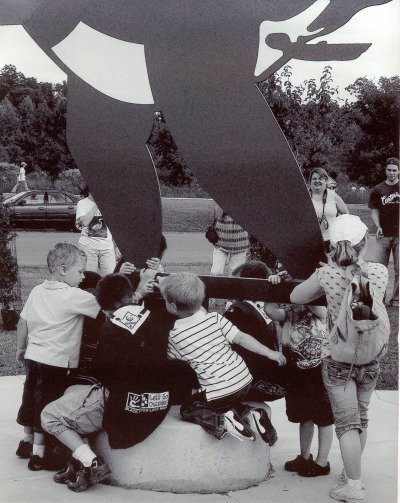 To become a member of the Arts Council, visit www.nelaarts.org. Ticket proceeds for All Over But to Cry will benefit the Arts Council and Black Bayou. Exclusive showing of the 2018 documentary "The Guardians". 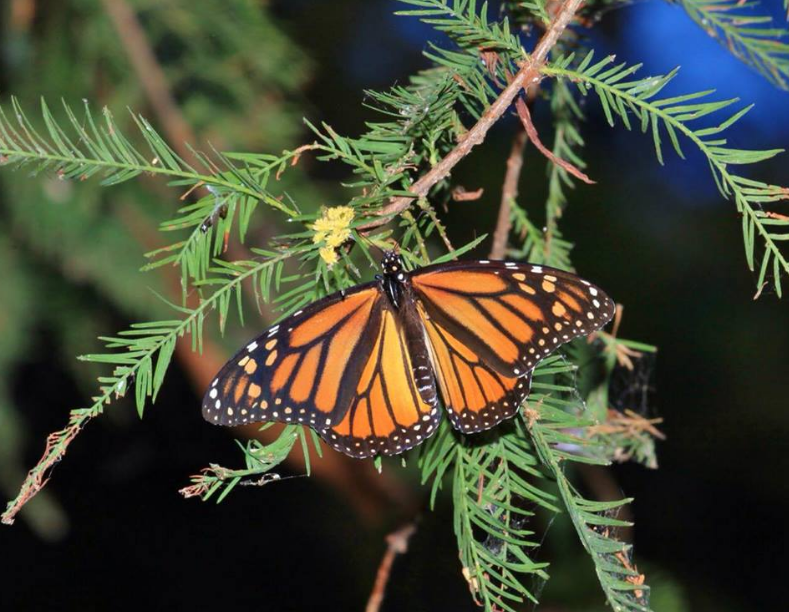 The film is about protecting Monarch butterfly habitat in Mexico. Thanksgiving is the full moon - rising at about 5:15. Come out and enjoy the full moon at the refuge. You can watch it on the pier and then come over to the amphitheater where we will have a campfire and hot cocoa and apple cider to enjoy. Get outside for Black Friday and add your tracks along the Edgewater Trail. It's our annual Ranger hike and we will be walking about three miles looking for critters and birds and enjoying being outside. Great way to walk off that turkey so you can have leftovers later. The moon is still over 99% full so come and join us for a ranger walk to watch it rise tonight. Join the ranger for a guided canoe trip out to the Eagles Nest. You can join us for free if you have your own canoe or kayak or can rent one for $10/person. If you do need one from here - please call 387-1114 to reserve. Bring snacks and a drink. Trip may be cancelled depending on weather. Our monthly Kids Program is on trees. Come join us at the Learning Center. Join the Friends of Black Bayou for our annual Holiday Party! This is a great chance to get a recap on the many excellent projects that are happening at the refuge and see friends! Bring a friend who might be interested, the more the merrier! Join is to celebrate the shortest day of the year and the first day of winter. We will have a fire, s’mores, cocoa, and some music. Meet out at the amphitheater. The moon will also be practically full that night. Join the ranger for a guided canoe trip out to the Eagles Nest. The trip is about 3.5 miles roundtripYou can join us for free if you have your own canoe or kayak or can rent one for $10/person. If you do need one from here - please call 387-1114 to reserve. Bring snacks and a drink. Trip may be cancelled depending on weather. Join the ranger as we walk and watch the full moon rise. December 18, 2017 6:30PM- Friends of Black Bayou Holiday Party! Come visit with friends as we enjoy fantastic food and friendship! All interested guests are welcome! As usual, bring potluck finger food, we'll provide drinks! Join a ranger for a walk on the trails to explore Black Bayou Lake at night. December 3, 2017 5:15PM- Full Moon Walk. Join a ranger for a walk on the trails to explore Black Bayou Lake at night. November 25, 2017 10am- Guided Canoe Trip - Call 387-1114 to reserve a canoe. November 24, 2017 10am-1pm- Work off the turkey and avoid the crowds during our 3 mile hike. Meet at the Visitor Center and take off with the ranger. November 24, 2017 11am- Guided Canoe Trip - Call 387-1114 to reserve a canoe. December 21, 2017 6:30-8:00PM- Winter Solstice Celebration - Star-gazing, a bonfire, and snores to celebrate the beginning of winter. 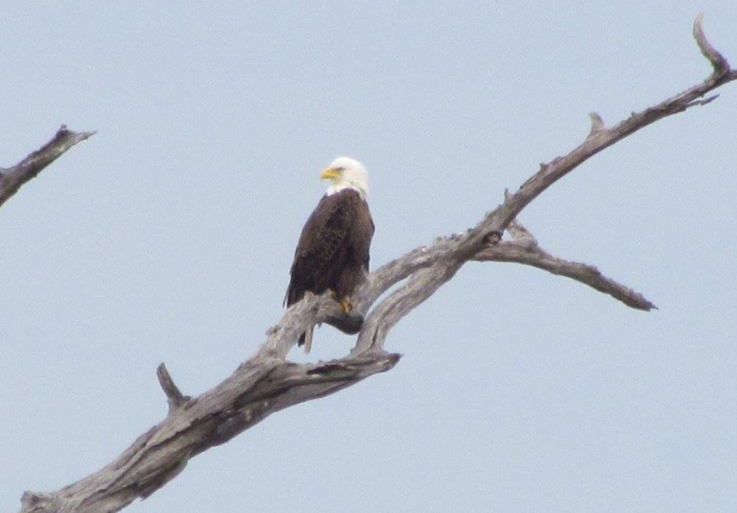 Come visit with friends and get an update on all the major activities on our area refuges! November 18, 2017 10am-12noon- Learn more about Leave No Trace with the Subaru Leave No Trace Travelling trainers. 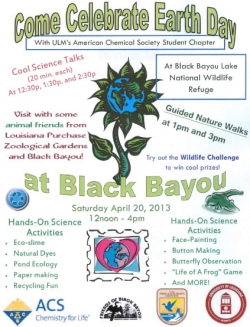 Come and find out more about how you can leave no trace and help keep Louisiana Beautiful. It's back this year - the haunted nature trail at Black Bayou and we will be adding some more stuff to it. Smores are back as well plus the bonfire for when you survive the walk. Come out anytime between 6:30 and 8:30. Costumes are encouraged. November 4, 2017 6:45-8PM- Our monthly full moon walk. FYI in Dec/Jan we will be doing two per month one for everyone and one for adults only due to numerous requests. Stay tuned for the dates for next month. October 7, 2017 - Kids Program Bats: Join us to learn more about bats in October and do a craft. It's our first full moon walk of the fall and this month we'll be focusing on noises at night. Learn more about herons, cranes and other wading birds. ​July 1, 2017 - 10AM - 5PM - (FoBB Event) Sausage Sale Fundraiser @ Brookshire's 165N Monroe. All proceeds for wildflowers/wildlife habitat. July 22, 2017 - 10AM-12PM Free Kayak Class Louisiana Delta Adventures host) Free kayak class. July 22, 2017 - 1PM-3PM Free Kayak Class Louisiana Delta Adventures host) Free kayak class. Mar 4 10AM- (USF&WS Event) Fish- Monthly Kids Program Ages 3-5 learning about fish (using paint and doing fish printing). Mar 18 - 9AM - Great American Cleanup Day - Refuge volunteers meet up at the Visitor Center for area assignments. 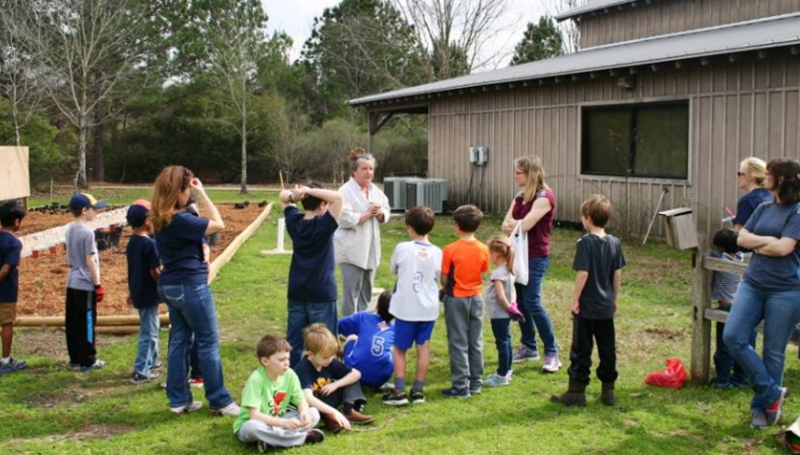 April 15, 2017 - (FoBB Event) Spring Celebration Standup paddleboard Demo, Mr. Barry & Hawk Delhi, migration olympics, flowerpot painting, egg junt, turning of the Blue Goose, dedication of Kid's Book Nook in the Visitor Center. ​May 2 – 7PM - (FoBB Event) Birds of Black Bayou Local Photographer Mike Colvin shares photos of birds of Black Bayou. 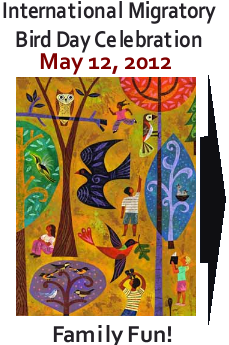 May 11 - 8:30- 9:30PM (USF&WS Event) - Full Moon Walk - Last full moon walk until fall. NOV 5 11AM - Froggy Investigations - Turkeys! FEB 21 5PM - Whose Teeth are Those?